We’ve given you episodes on selling your business, but what if you’re on the other side of the transaction? James Schramko invites Eric Owens from AppBusinessBrokers.com to share his expertise about why you might buy a business, what to look for, and how you can ensure a satisfying ROI from your purchase. 12:33 – Can businesses do without capital injection? 19:10 – Can transactions go sour? James: James Schramko here. Welcome back to SuperFastBusiness.com. Today, we’re covering the topic of buying a business. We’ve got plenty of episodes on SuperFastBusiness about selling. And for every one who sells a business, someone has to be buying that business, so I’ve brought on a specialist in this field. Eric Owens from AppBusinessBrokers.com. Eric has been selling businesses and facilitating transactions for people with internet, e-com, SaaS solutions, mobile apps and has built up a fairly good reputation. 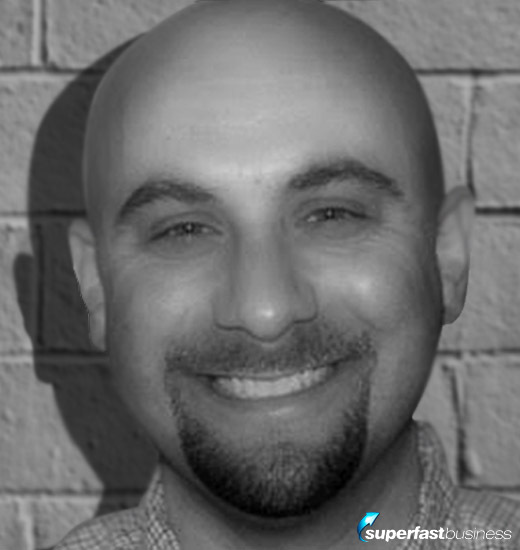 I actually originally got referred to Eric from Ezra Firestone, another great friend of our SuperFastBusiness community. Welcome to the show, Eric. Eric: Yeah, thanks, James. Appreciate you having me on. Yeah definitely, Ezra’s a cool person. I’m glad he connected us up way back when. James: You know, Ezra has, I think, started and sold quite a few e-commerce stores. And originally, when I was looking to enter into selling my businesses, I asked Ezra who’s good at this. And he sent me your details, and we had a conversation, and you sent me over a checklist. It turns out I was able to just sell the business myself. But I think that was through probably a fortunate scenario of both the business units that I sold, I ended up selling to customers of mine. So I already knew the buyers, which took away a huge part of the equation from the point of view of a broker. And also, I’m pretty comfortable with buying and selling from my previous experience, so that I wasn’t worried at all about the negotiation phase or the pressure of making offers or the scrutiny. I’ve seen it all before in high-pressure sales environments. So, two of the factors that I imagine are very appealing about a broking service were not present for me. However, if I didn’t know the customer or if I was uncomfortable buying or selling, I think a broker is going to become a really great asset for someone in that situation. Is that correct? James: So just a very short contextual backdrop for AppBusinessBrokers.com, what sort of transactions have you been working with over the last few years, to give us a feel for the scope and the relevant history that you’ve had in this field? Eric: Yeah, definitely. I’m like an old timer in the internet business world, where I’ve been doing my own internet business stuff for almost 20 years now and sold my own internet businesses back in 2003 and just started lining up deals for other people and brokering deals ever since then. I always kind of loved it in terms of helping seller clients sell their business and transform their lives. Especially some people have gone on to do really well, like Ezra. We helped him sell his costume website way back when and some other guys like Matt Clark and Mike Koenigs and Andrew Fox, those type of guys. So we love that part of it. I think the internet business industry has been really interesting the last couple of years especially. It’s been growing up really, really fast. I’d say where the businesses are getting more sophisticated and substantial and now buyers of all different varieties are looking to buy internet businesses, where before it used to be lots of individuals buying lifestyle-type business approach where now that there are bigger businesses, we’re getting private equity companies and other, bigger companies that are looking to buy internet businesses, which is way different than it was just a couple of years ago. The deals that we have been working on lately have been heavy on the e-commerce and SaaS business side of things. E-commerce ones, some with a mix of Amazon or their own direct e-commerce stuff. The SaaS one is definitely, we love those businesses and sort of buyers. So that’s the direction we’re going to keep going is largely SaaS and e-commerce-type businesses. James: Where do you see the mobile app front heading? Eric: I think on that side, there are some people doing some interesting things where they’re doing almost like a roll-up strategy, where they’re acquiring multiple apps and user bases and then leveraging those user bases across multiple apps, multiple portfolios. We have some buyer clients in that niche where they also develop user bases and they end up licensing out the data into companies, which is a totally different model than most app entrepreneurs or app developers use. There’s actually one direction there and that I think for some businesses, they can do well with buying some apps or portfolios if it gives them a built-in audience to use for their main business. It can be a good add-on when you think of leverage. It’s definitely tough in general for any developers to compete in that space now. Not impossible, but it’s gotten a lot more tough there. James: So you think it’d be hard to launch the next Doodle Jump? Eric: Yeah, yeah exactly. Yeah definitely. A lot more challenging now than it was just a few years ago. James: So what I’m interested in is the motivation comparing the seller to the buyer. So, let’s say we have someone has a SaaS that’s quite popular. Why are they selling it, and why is someone buying it? Eric: Yeah, it’s a great question. A lot of our clients tend to fall into the mode of like where they’re probably serial entrepreneurs and they started their business and got really good at doing a couple of different things with the business. Whether it was marketing, or converting traffic to sales or the product itself, and then lots of times what they do is they get it to a certain level where they need to start looking at things like building out systems and adding on more team people, whether it’s outsourced people or actual full-time employee-type scenario. And then sometimes too they just need more capital to grow it to the next stage. And lots of our seller clients, once they get to that point, if they started it from scratch and kind of intended it to be like a lifestyle business or a fun-type business for them, they kind of get to that stage in their mindset, it’s usually like, it doesn’t sound very fun anymore to go do those things. And lots of times too, it’s just also outside their comfort zone in terms of growing in it from, I’d say, usually it seems like going from the one to five million a year revenue type numbers up to 10 or 20 million a year. That definitely takes a different mindset and resources and leadership within the business to do that. So, it’s not actually what they’re looking at. They almost feel like they’re not the right person to take it to the next level. That’s largely the mindset, the kind of conclusion that they arrive at. James: And do you think there should be any shame in that, or is it OK that, hey look, you are a person who likes to start things and get it to a certain point and then there’s other people who will then come along and they know what to do with it and to take it to the next stage, and they’re happy to just pay money and have it now than to be growing their own? Eric: Yeah, definitely no shame in that at all. I mean part of it’s just you know whatever your internal motivation is, but a lot of our seller clients, sometimes they don’t exactly want to let it go but at the same time, they know that it’s the right thing to do for them and for the business, where if they plow ahead and try to grow it out themselves, they’re going to end up burnt out and frustrated and who knows, maybe even tank the business. It could end up failing versus they can sell it, get some capital and have time off to do what they want or start something brand new with their own capital behind them. That’s what a lot of our clients end up doing. James: So it could be like the father who just loves growing grapes in his vineyard and then he sells those grapes to a winemaker who will then buy those ready-to-go grapes and then squash them up in the vats and store them and then sell them and take them to market as wine. And it could be actually a distribution sale at the end of that too, where they sell it to a company who puts it in the stores and then sells it to the end user. So some people can handle the whole chain and other people just like to focus on their part of it. I think some of this comes down to knowing where your sweet spot is. Are you a starter, or are you a finisher? And that will probably determine whether you’re a buyer or a seller in some cases. Eric: Yes, sometimes it does happen. It seems to happen most where there are scenarios where there’s like two or three business partners involved in a business and one of them ends up having their lifestyle changes or something happens in their life or they want the business to go in a different direction than their partners do. So sometimes, they’ll look to sell off part of it and bring on a new investor instead of keeping a business-partner relationship. And the buy side is I’ll see people who, they look to buy businesses, but for a lot of them, the ideal scenario is for them to invest in a business and then the current owner keep running it, or they invest in it and bring in someone else to run it and just work with the current owner to make all that happen. We’re definitely starting to see more of that. We have a deal in closing right now for a small SaaS business where the two founders, they’re selling off really 90 percent of it but they’re still going to keep 10 percent equity. And I work with the new owner to help them grow it out. It should work out really well all around. James: Right. That’s pretty common in the property industry to develop and build a whole building and then they sell off most of it and keep the penthouse suite or retail storefront down the bottom for themselves. So they got some skin in the game. So if you had a partnership of two and one is decided they want out, can a broker help the remaining partner find an investor to fill that spot? Eric: Yeah. Usually, it’s something that we could help line up. We definitely, in general, kind of look for more scenarios where they’re looking to sell off the whole business, but sometimes it’s that it happens dynamically too where we’ll get a seller client where they go into it thinking they want to sell the whole business and then during the process of selling, we help them come up with some ideas on improving the business and getting ready to sell, where they start to fall back in love with it a little bit. But they still might need some capital to grow it to the next level and they know they can’t just self-fund everything. So those are the scenarios where lots of times, they’ll bring out an investor who usually can add the financial capital and use some of the value they bring to the table as well. James: Do all businesses need this capital injection? There must be occasionally businesses that are self-funded, with a good profit margin and are privately held and just continue to snowball? Can you continue without capital injection? Eric: Yeah definitely. There’s some. One trend we’re seeing lately though is like with e-commerce businesses where people are selling on Amazon or other platforms where some of them may go from zero revenue to within a year or two, we have one client within two years it started and now they’re doing $6 million a year in sales, over a million dollars a year in profit. Now for them to keep growing beyond that, they definitely need to start doing things like buying, doing some larger inventory purchases and where they have to better manage their cash flow. Where they might not need capital, but they might need some things like lines of credit and at least start doing some more financial management than they did when they first ran as a lifestyle business. James: Now what sort of profit margin spread would you say for a typical business that is looking to sell? And also, we should be clear here, this is when you take into account the owners paying for their groceries and fuel bills and stuff. Those records should be kept out of the business and paid as a wage or something to keep it separate, right? To allow for a commercial wage for the owner instead. Eric: Yeah definitely. That type of thing, that’s one thing where, as these Internet businesses get more sophisticated and keep going in that direction, that’s one thing the owners, the startup entrepreneurs are going to have to do a better job of, where it’s not exciting to keep clean financials, but the payoff down the road can be the difference. James: It is so easy now. If you just run Xero or Quickbooks and you have someone in your team allocating costs, it’s just so simple to like, even just to pay yourself a wage for non-business deductible expenses and just separate it out. It’s pretty straightforward. But I do see a lot of small business owners drawing all the money out of the business just to fund living expenses and non-business expenses. It’s going to be impossible for them to sell that business. Eric: Yeah, exactly right. It looks really messy, especially for smart buyers looking from the outside in. They look at it and it just raises questions and red flags and they see it. They de-value it for sure because they see that it’s not been run as a real separate business entity. It can do in the clean financials, so you can pay off big time nowadays for sellers because there’s more buyers now that can actually get financing for these type of businesses, whether it’s regular bank financing or here in the US, we have the small business administration loans and lines of credit. There’s alternate funding sources showing up now, with places like lightercapital.com and saascapital.com. With those ones, they’ll fund the businesses, but the businesses do need clean financials and tax returns and things like that where everything matches up, then it makes it nice and clean and easy and opens up a lot of doors for sellers to be able to sell for maximum value versus taking a price and deal structure that might be way, way less. James: Right. So clean financials and having good, up-to-date tax returns are going to make it easier for the seller. And it’s much easier for a buyer to say what they’re actually getting. Eric: Yeah. And financially, I mean it can be the difference between me doing a deal where it’s, you know, it’s something like, whatever, one and a half, two times the yearly free cash flow of the owner to something where it’s more four to five times that. James: So let’s talk about the profit spread. I didn’t get a number out of you. I probably should. Eric: Oh yeah. Profit margin wise, we see that all across the board. But I think for like the SaaS businesses, it’s one of the appeal for them is they can be really high profit margin. I think we have one right now that’s about, think it’s close to like 80 percent margins. The e-commerce ones, they do seem to get to a certain level, maybe certain niche markets that don’t have as big a margin. But some of those seem like they range in like the 20 or 30 percent at least, somewhere in that range. James: Right. Well 80 percent sounds extremely high even for companies like Facebook, which are effectively an app. They’ve been less than half of that I’m sure. So what about multiples? The multiples are going to be different depending on whether the business is one-time products or recurring and whether they’re in certain niches. Eric: Yeah, definitely. The ones that you said, the big thing is recurring revenue. I mean, any business that has a recurring revenue, likely there’s going to be a buyer for it out there somewhere, and they’re probably going to pay way more than they would without that. That’s one of the reasons people like the buyers like the Software as a Service model because it’s something that typically is proven. Lots of times, they’re not all B2B type models, sometimes it is B2C for SaaS stuff. But in general, the ones we see, they’re really heavy business-to-business type stuff. B2B SaaS recurring revenue, those are the ones we see that get the highest multiples. We got one deal done, I think it was close to like seven to eight times the core profit. But whatever number, you consider that to be, so versus e-commerce ones, those ones so far have tended to sell for somewhere between these days like two to three and a half times the yearly, even to type a number. Some are trending up a little bit bigger. Once they get up to where they’re doing over a million dollars a year in profit, then it opens up the door to some bigger buyers. They look for that number. It’s a definite target for them – the million dollars a year in profit. I think they see it like a more defensible business where that cash flow stream isn’t going to go away at that point. James: And what about if it’s a personal services business or it’s more of an informational business? Do multiples start to come down a bit? Eric: Yes, definitely the service ones, we’ve experimented around with that a little bit. We don’t do a lot of those these days, but the couple we have sold definitely fall in more like the one to two times yearly type of number. James: Well that’s still, you know, even a personal service business, the owner selling that could have a year or two off and start something else, still get paid as if they’re working, right? That’s all very interesting. I’m just wondering, in terms of us buying a business, what sort of statistics have you seen for once the sale has taken place between the seller and the buyer in terms of success rate? Do the transactions turn out to be good or bad in hindsight for the buyers? Can a deal go bad? Eric: Yes, it’s a great question. We’ve never had any go bad. We look to help structure deals where it’s going to make sense for the seller to sell and then also for the buyer where they’re going to be able to get an ROI on it as long as they don’t totally just horrendously mismanage it for some reason. The only time we’ve had anything bad is when we have one website hosting deal with years ago where the new owner came in and they decided to change it from like monthly billing to yearly billing and also like whacked all the affiliate commissions for their whole affiliate program, which was a key marketing channel. That one, it started to go down pretty quickly after that, as you can imagine. But the previous owner was able to step back in and help him get it back up and going. We had another one where the buyer, the guy who bought, it was part probably SaaS and part information product business. They wanted the SaaS and they bought the whole business with both included. I don’t think they really knew what they were going to do with the information product business, and they ended up, I think, over a period of time, they just handed that back to the previous owner because they didn’t really have a use for it. Think on the buy side, definitely, it’s important they have a clear plan of what they’re going to do with the business when they do take it over. Most sophisticated buyers do, whether they’re going to be leveraging the customer base or the products, they typically have a clear plan on that. The one thing I have seen with more individual-type buyers that are buying some of these e-commerce businesses that I would encourage them look for is a scenario where the current owner is willing to work with them over some period of time to help roll out new products or where the current owner has a solid product plan in place. So if they’re going to keep the business, what products they would roll out over the period of the next year. That way, it gives the new owner a good plan of attack and they should be able to keep the revenue going no problem with that kind of thing in place. The current owner usually is going to understand that niche market a lot better than the new owner. James: Yeah, that’s nice. I’ve seen this work well where someone sells the business and then they go on a percentage of revenue coaching retainer to continue to grow it from the point of sale upwards, so that it’s positively benefiting them if it increases. And there’s no payout if it decreases. James: What sort of things have you seen as new trends for buyers in the market? You mentioned before already that there’s new people coming into the market that you haven’t seen before, like actual investors, and now you can even get loans for it. That must really open up the potential competition for people trying to buy businesses. What sort of weird or strange things have you seen them asking for or doing that they might have brought from outside the traditional industry that is changing the marketplace? Eric: Yes. There’s definitely a few things. One really odd request is we had a buyer where the business has like nine years of history, and they wanted to see every single year of the past nine years of financials. Even though, nine years ago, it doesn’t really mean much nowadays in the internet world. But I think the buyers in general, they’re also starting to look at things like metrics within the business, that before they didn’t really even care about. So it helps if sellers know their niche market or any industry-typical benchmarks, like profit margin for example. If most people are getting a 10 percent profit margin or 20 percent, you can set it up where your business is doing 40 percent. It makes your business way more attractive. It sounds simple, but there can be metrics like that where they just set it apart for the business buyers. One of the things we’ve seen is we’ve definitely seen some buyers now, they’re looking for a whole bunch of different things around what I would call defensibility, whether they’re looking for deals that the business may have some products that are either they already have patents, or stuff within that business that could be patentable. They’re looking for trademarks. They want to make sure that the business brand name is trademarked and ideally, key products are trademarked wherever possible, just to keep other people from using those names and stuff. And they’re definitely looking for more things, like more sophisticated agreements in terms of like product licensing and supplier agreements. Things along those lines. And then also too, any sales channel type exclusive agreements, like special terms that the current owner can pass on to the new owner. Those are some of the big things we’ve seen lately. James: Have you ever seen someone buy a business just to shut it down as a defensive move? Buying to shut down a business? James: But it’s really common for large companies like Google and Facebook to acquire the business units that they think could compete with them. And quite often, they’ll leave it stand as its own thing. But then occasionally, they will just roll it into the whole machine. You mentioned that you would be looking for supplier agreements. What other documents would we need to be looking for if we’re going to buy a business? What must we validate? Eric: Yeah, it’s a good point. Of course financials, and that’s the key thing. And then, yes supplier agreements, especially nowadays, especially e-commerce businesses where they’re sourcing things from China. Just a different world than what… they’ve never owned a business and done product-sourcing stuff, then they definitely want good solid supplier agreements for that type of thing. We’ve had some seller clients where they’ve actually gone to China and established networks and connections there and have offered to basically take the new owner over there and make sure those connections get made in person. A little bit more old school. 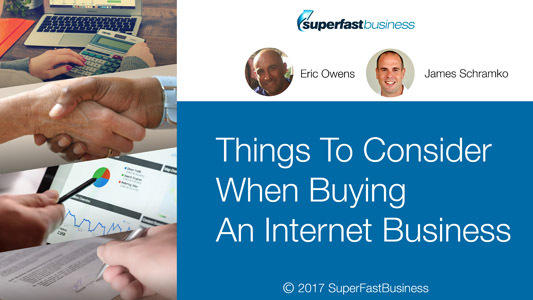 You don’t think of that when you think about internet business, but when you’re doing bigger deals, often that’s how business is done lots of times. James: That’s exactly what I offered with the sale of my service business, was a face-to-face introduction with the team in a different country. I talk about an asset register, which is kind of like an online version of the book, but it’s a central register with links to all of the documents and IP that an online business needs, like the domain name, the standard operating procedures, the team members, the database – all those things are all linked from one document. Have you ever seen a sale go through where there was something missing or maybe you’ve picked up a client who tried to sell it before and it fell over because it had something missing that is like a real rookie error that you would advise people to be cautious about? Eric: We haven’t seen that exactly. But what you mentioned, I mean that’s awesome to have in place for sure. That’s something that the buyers are looking for nowadays. People that are used to running offline businesses where like all the stuff is expected to be in place where you’ve got the systems, processes and procedures, and it’s written down somewhere. It’s not just in the owner’s head or in the head of a VA, where it’s actually written down somewhere. So if the worst case scenario happened and the owner just went away, that someone else could step in and actually just run the business to some degree. James: Well, we treat it like an in case of emergency file, it’s like someone should be able to grab that. It’s like you’re in a plane and the pilot’s passed out. You should be able to follow this asset register and find every vital document for the business. It’s designed to improve the works-without-me factor, which obviously is a constant battle for small-time business owners as they grow their business, to let go of things and turn that thing from a job into something saleable. James: Well certainly, some things are easier. It’s a great point you mentioned. Before I sold my businesses, I had to separate them out onto their own websites, make sure that all of the database was tagged and segmented, which already was, luckily. It’s easy to export a database. But by far, the hardest thing is recurring billing with things like PayPal or credit card. Ideally, you’d set up a separate cart for each business unit, if you know it’s going to be a decent size business unit, and keep it on it’s own billing system. Things like Stripe for example. Apparently, it’s easier to just hand over a Stripe account to a new owner. So you could set up a new Stripe for each business division, which is what my clients are doing now. In the case that they want to sell the business, it’s easy to hand that off than it is to move a Paypal account. And then you sort of get into the more complex stuff like are you selling the assets of a business or are you transferring the entity? And from what I can tell, a lot of these businesses, they would rather buy assets and move the assets across from one entity to another than to take on the potential risk of getting involved with some foreign entity. Eric: Yeah, yeah typically. That’s exactly like almost always what they look to do. Once in a while, there’ll be some scenario where it makes sense to do an entity deal. But yeah, usually they like to avoid any potential risks there for sure. James: Yeah. Imagine if you’re bringing an investor in to replace a director or a shareholder and owner of a business, then they are probably going to be more direct. What are some of the other sophisticated things you’re seeing with buyers, like deals that might be more creative or that are options? I know I’ve talked in previous episodes about basic ones like vendor finance and earnouts and taking a passive role, even taking revenue share deals. There must be ways that people are structuring this when they don’t have the cash. Eric: Sometimes there’s creative ways, and I think a lot of times it comes down to what the seller is looking to do. We get some buyers where they’re able to do some deals. We just did one recently where it’s part cash and then part seller financing and some vendor financing. It can work out well for the seller depending on their financial scenario where they will spread that money out over time versus taking it all in one year as a bigger tax hit. And also too on the buyers’ side, I think a lot of it in the back of the buyer’s mindset, there’s the financial part and they’re also looking at it as like, how do I minimize my risk and make sure I get an ROI on this deal? So those are where some things can work well. We just did an e-commerce deal where it was part cash and then a good chunk of the deal was backend money for profit sharing, where the owners had some specialized knowledge in this niche market that conceivably, they’re not going to be able to transfer it all in like a 30 or 60-day training period. It’s going to take some time. And so the new owner wanted to work with them and be able to help roll out some products and utilize their insider knowledge. So you know, some profit sharing and stuff that almost tends to be impartial, like part equity. But I think that buyers these days can get some more creative hybrid deals done if they know what their desired end game is and then it’s a matter of finding the right business and the right seller that matches up with that. James: Perfect. Yeah, I think it pays to be creative if it allows you to do a deal that can’t be done any other way. I mean ideally, I’m sure a lot of sellers just would love you to pay all the cash upfront and be out of the business with zero risk. I don’t know if it’s that competitive that they can always demand that. But if you’re looking at a collaboration, it can work really well. Eric: Yeah, definitely. And the people that are some of the more sophisticated buyers buying these internet businesses now, they’re used to doing deals in the offline world that are not 100 percent cash. I mean it happens sometimes. You hear about those type of deals, the bigger deals where some company gets acquirers for some crazy valuation and it’s all cash or whatever. But that doesn’t happen on a day-to-day basis. Typically, it’s more combination of cash and seller financing and earnout or equity. The more typical real world business scenario, they’re definitely bringing that to the internet business acquisition type of stuff. James: Who prepares and pays for the legal agreements? Eric: Yeah, it’s a great question. For our deals, the smaller ones at least, we have a base contract our attorney created, that we normally start from just to help save some time and legal fees. But at that stage, buyers almost always have an attorney involved. And then our seller clients, we even encourage them to have an attorney involved at that point just to at least do contract review stuff and make sure they’re protected for their current business and what they want to do next and also, you know, what they have going on in their overall personal life outside of the business stuff, which as brokers, we don’t usually have visibility into everything. The contract review stage definitely encourages both sides to have an attorney involved at that point. James: Right. So would the more advanced buyers be sometimes generating the purchase offer, or is it usually the seller providing the contract of sale? Eric: Yeah. The sophisticated one is usually the buyer that’s driving that, that’s coming to the table with their contract, so on the flipside, sellers definitely want to have an attorney. James: Is it a case that whoever prepares the contracts, it’s usually slightly biased towards them? James: I’ve done a whole podcast series on this with a lawyer and it is funny. My advice or my opinion is simply get it ratified. If you’re going to do a big transaction, involve a legal person who’s specialized in that. Not because you love spending the money, but because their job is to protect you from making a terrible mistake. James: Yup. I’ve seen people get bankrupted from signing a contract. You know, just backdrafts them into someone else’s affairs unknowingly. It’s definitely one to watch for. So gosh, we’ve covered quite a range of things, from the point of view of a buyer and also a seller and especially given some good ideas on things to look for for margins and deal structure and documents that we need to be mindful of and some of the changes in the industry. Eric, what should I be asking you as we close out here? What’s another important topic that I’ve may be overlooked so far? Eric: I mean you know, one thing that I still see sellers make the mistake of and buyers are asking for this more and more is where, I guess it’s part of human nature when you’re first starting up a business where you get good. You’re relying upon like one traffic source or one source of sales where buyers now are looking at where they ideally want to see like some customer acquisition strategy where there is some proven repeatable system for acquiring new leads and customers with multiple traffic sources to accomplish that versus they say some other ones rely on one source of traffic like Amazon for example, which works great for cash flow. But buyers will value that a lot less than they would, say, an ecommerce business with multiple sources of traffic for leads and customers. James: That is a hot tip. I’m so passionate about that. I even created an entire course on it called OwnTheRacecourse because single-source dependency sinks a lot of businesses, and that’s everything from payment processes through to support, to product lines, etc. That’s such a great point, Eric. Well, I think we’ve delivered quite a few ideas here. I’m going to say thank you for coming along to the podcast and talking about these issues as a seller or a buyer of a business. I’m sure something’s going to pop out from this episode. Eric, thanks for coming along. Eric: Yeah. Thanks so much for having me. This was great. I really appreciate it. James: So, I’ve been speaking with Eric Owens from AppBusinessBrokers.com. If you’re looking to buy or sell a business, I suggest you check out his website. Get in touch. He’s extremely knowledgeable in this topic. If you have a substantial business and you want to make it better, than I could certainly help you with my coaching at SuperFastBusiness.com or SilverCircle.com if you have a bigger business and you want to protect yourself from some of these mistakes. Or if you want it to get ready to sell, then I know that I could help you as well. All right, well that’s another episode. Thank you for joining us.